I had a blast knitting hats for everyone* for Christmas/Chanukkah this year. (*Laura got a hat recently, so this year she got mittens.) 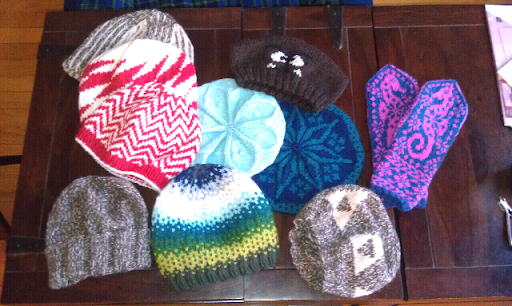 This isn't all of the presents that I knit, because I had already shipped some of them to Boston. I hope everyone liked their gifts! Nice - I make a large portion of my gifts for our large family. And it gives me great satisfaction to do so. And I certainly enjoy the nice comments. Those look so nice! Where did you find the patterns? I'm hoping to knit/crochet stuff for Christmas for the upcoming year. I found many of the patterns on Ravelry.com (they are in my notebook under username chemknitsblog.) I will be sharing more details about these projects in the following months. The sad thing is that the box containing these gifts got lost when I sent it to Boston. I now have to hope that the box was sent back to my house in IL when mail starts again tomorrow... I've now learned to always use a tracking number!